"Major wildfires burning across the West have consumed tens of thousands of acres and forced evacuations in at least three states. In New Mexico, one particular wildfire exploded in size on Thursday. Dry conditions are hampering firefighting efforts in a region that's expected to see dangerous and potentially deadly heat over the weekend and into early next week. "Humidity values less than 15 percent and dew points as low as the single digits will be present and persistent across a large portion of the Southwest through at least Sunday," said weather.com meteorologist Jonathan Belles. The most extreme heat in the coming days will be in the Desert Southwest where highs could climb to near 120 degrees, including in Phoenix, where it hasn't been that hot in more than 20 years. The largest of these fires has burned more than 30,000 acres in the San Mateo Mountains of southwestern New Mexico over the course of nearly a month. "More than 100 firefighters are working to extinguish a large factory fire at Greenacre, in Sydney's south-west. The fire, which remains uncontained, broke out about 3:30am in a car wrecking yard, and has spread to a blinds and awnings factory. About 20 fire trucks are at the scene on Rosedale Avenue. Fire and Rescue NSW said two buildings were alight." "Governor Jerry Brown on Friday issued a state of emergency for Kern County due to the effects of the Erskine Fire, which has claimed two lives, caused the evacuation of thousands of residents, burned thousands of acres and damaged homes and critical infrastructure. Two people died in the fire that exploded in size Friday to nearly 30 square miles, consuming about 100 structures, including homes, as it tore through several rural communities in Central California, northeast of Bakersfield, authorities said. In an afternoon news release, Brown issued a statement expressing sympathies to the victims' families. "Anne and I extend our heartfelt sympathies to everyone impacted by this destructive blaze," he said. "We join all Californians in expressing our gratitude to the courageous firefighters, emergency personnel and volunteers working tirelessly throughout Kern County to help residents and extinguish this fire." A wildfire swept through a Kern County community Thursday June 23, 2016, leaving behind destruction. 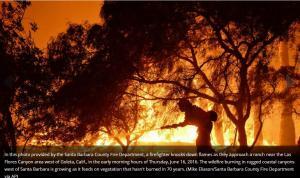 More than 100 buildings, including homes, were destroyed by the fast-moving fire near Lake Isabella. About 20,000 residents remained out of their homes Monday as the 51-square-mile Sand Fire continued to burn in Southern California's Santa Clarita Valley. The fire has burned about 10,000 acres per day since it began Friday in the hills north of Los Angeles, growing at a rate firefighters described as "almost unprecedented." "It has averaged about 10,000 acres per day," said Chief Mike Wakoski, incident commander. "An acre is a football field, so imagine that -- 10,000 football fields per day." Shifting winds have fanned the flames, which raced through neighborhoods and destroyed homes. One death, a man whose burned body was found in a scorched vehicle, was reported in the fire zone." "Firefighters are battling a 3,000-acre wildfire in Northern California that destroyed at least 175 buildings and forced about 1,400 residents to flee their lake community, authorities said Monday. The fast-moving Clayton fire broke out late Saturday afternoon off Highway 29 and Clayton Creek Road, forcing the entire community of Lower Lake — located in Lake County, more than 100 miles north of San Francisco — to evacuate, officials said. Bulldozer operators spent much of Sunday night and Monday morning carving extra wide fire lines along the town of Clearlake’s eastern border in an effort to contain the blaze. The fire doubled in size Sunday as it reached Main Street in Lower Lake and burned the post office, a winery, a Habitat for Humanity office and several other businesses, according to the Associated Press. Sixteen patients at a hospital in neighboring Clearlake had to be transferred to another facility 25 miles away. "A California man was arrested Monday on arson charges for allegedly sparking a wildfire that exploded over the weekend, destroying more than 175 homes, business and other structures in a Northern California town, authorities said. The wind-whipped had spread to more than six square miles in the Lower Lake area about 90 miles north of San Francisco." 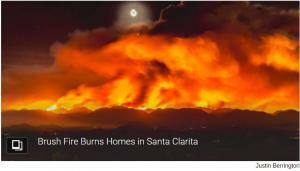 Fire tornadoes, also known as firenadoes or fire whirls, are spiraling out of wildfires east of Los Angeles this week. Wildfires have scorched more than 25,000 acres of mountain and desert near San Bernardino, Calif., where at least 82,000 people have been told to evacuate. And the fire isn't just spreading across land, the extreme heat and erratic winds are also shooting firenadoes into the sky. The Bureau of Land Management defines a fire whirl as a "spinning vortex column of ascending hot air and gases rising from a fire and carrying aloft smoke, debris, and flame" that range from less than a foot to 500 feet in diameter. It's a tornado on fire. Terrified guests are trapped inside a burning Hilton hotel as a huge wildfire engulfs the Tennessee resort towns of Gatlinburg and Pigeon Forge. Dollywood theme park has been evacuated as thousands of tourists and residents fled the Great Smoky Mountains amidst reports of cars bursting into flames, dozens of homes being engulfed by fire, and the sky turning brown with smoke and flames. Motorists clogged the roads after the Gatlinburg Fire Department ordered the mandatory evacuation of the town at just after 6pm on Monday, as strong wind conditions fanned the flames making the fire increasingly unpredictable and dangerous. Meanwhile there are also fears for over 10,000 animals at Ripley's Aquarium of the Smokies, which is also surrounded by flames. And although rain is forecast that would dampen the flames, strong winds are also predicted, which would hamper the effort to tackle the fires. It comes as terrifying video shot from the Gatlinburg Park Vista Hilton Hotel appeared to show flames just outside the windows, as guests huddled together inside. I have to say watching this video really upsets me. when he said no one knew, no warning, nothing, I have to say I believe him. I live 90 miles north of Atlanta and these fires started well over a month ago and no one, NO ONE was reporting on them. The news actually just began reporting on it when Atlanta began to get the smoke from the fires, which by then had spread to so many areas (and of course so many of them are started by idiot/arsonists). I hope they burn in hell. So frightening. Idk. Considering the severe drought conditions, it doesn't really seem unnatural for a fire to spread like that in a very woody area. Gatlinburg is about 1,000 feet lower in elevation than Asheville, NC (which can be pretty damp just from fog and clouds), which is also in the Smokeys. Down lower, things probably did get quite dry, if it's anything like it's been here. We have been on burn restrictions for a while down here and I think it was only a week ago that it rained for the first time in over a month. And things have been burning in the forests for weeks. Fires have been burning in Western NC (which is the same mountains as East Tennessee) for weeks. We had our own fires in the SC Upstate. We have had air quality cautions for weeks from the smoke. Our local news does talk about these things and I only follow on Twitter. I don't disagree that someone probably set this fire, whether purposely or accidentally, but given the right conditions, including the pick up in winds, I can imagine it spreading quickly. It only takes a few sparks. 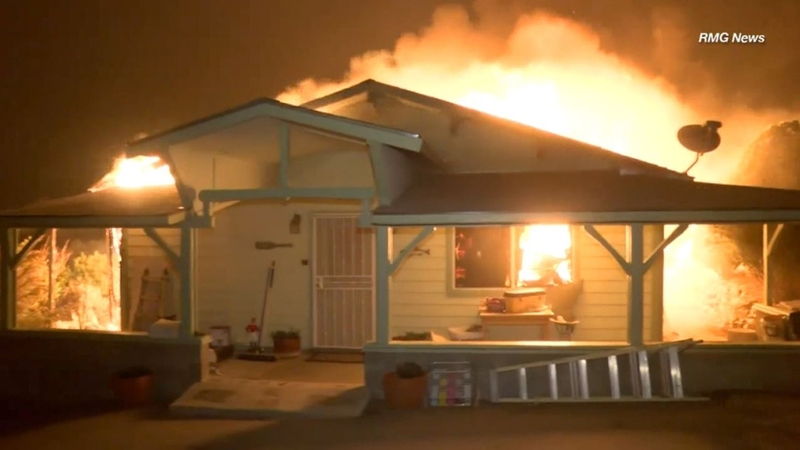 That's why often other people's houses catch fire even though they are many feet away from the original fire. Fires spread that quickly in California too, there's just usually more unoccupied land to burn while they get ahold of a plan to keep it away from inhabited areas. Most of those fires aren't started by lightning either -- usually ignorant campers. It's very unfortunate, but not in the realm of the unbelievable. Eleven months ago the Anderson Creek Wildlife burned its way across 390,000 acres of Oklahoma and Kansas, killing hundreds of cattle, destroying millions of dollars worth of buildings and fences, and endangering the lives of hundreds of residents and volunteer firefighters. It was the biggest known wildfire in Kansas." "WICHITA, Kan. (KSNW) – Several fires across the state challenged local firefighters and law enforcement agencies. On Saturday, fire crews had to shut down traffic in north Wichita to fight a grass fire near the area of Hillside and Highway 254. In Hutchinson, several fires kept emergency crews busy. Several units from Hutchinson fire are battled a large grass fire affecting the area of 43rd Avenue to 69th Avenue and K-61 to Willison Road. Crews also battled brush fires near the Reno County Landfill and in the area of 17th Avenue and Apple Lane." "Firefighters continue to battle wildfires in Amarillo, Texas, and surrounding areas in the panhandle. According to KFDA-TV in Amarillo, three people died in Gray County while they were trying to save cattle in the area. Some cattle did not make it through the fire. KAMR reported that a fourth fatality was reported in Lipscomb County. Reports from the Texas A&M Forest Service said the Perryton Fire located in Ochiltree and Lipscomb counties in the Texas Panhandle is an estimated 295,680 acres in size. The fire has skirted south of the city of Higgins as of 11:58 a.m CST Tuesday. Texas A&M Forest Service has been on the scene with ground resources working in conjunction with local resources. Two homes have been reported as destroyed. The Dumas Complex Fire near the city of Amarillo, Texas, is 100 percent contained, leaving an estimated 29,197 acres burning as of 5:19 p.m. CST Tuesday. Governor Greg Abbott activated state resources to help combat the fires. Air attack aircraft was assigned and two single-engine airtankers have made fire retardant drops on the fire Monday evening. State fire marshals are investigating the cause of the wildfire and the four fatalities. The combination of strong winds, dry air and dormant vegetation in the central United States will continue raise the risk of brush fires into midweek." This is in the Western Cape, South Africa, sending positive vibes their way. "The federal government has announced it will help B.C. battle out-of-control wildfires sweeping through the province. Ralph Goodale, federal minister of public safety and emergency preparedness, said he approved the provincial government's request for help on Sunday afternoon. Federal Defence Minister Harjit Sajjan confirmed that the Canadian Forces are on standby." Cliff Chapman, the deputy manager at the Kamloops Fire Centre, said Saturday was an unprecedented day in his career. "I've been in this business for 17 years, from crew all the way up to where I am now, and I haven't experienced a day like we experienced yesterday," he said." They are having a bad time in BC with wildfires and winds, even said rail lines over the Rockies are shut down. I know we have CHANI members in BC, wishing them all safety from these fires. 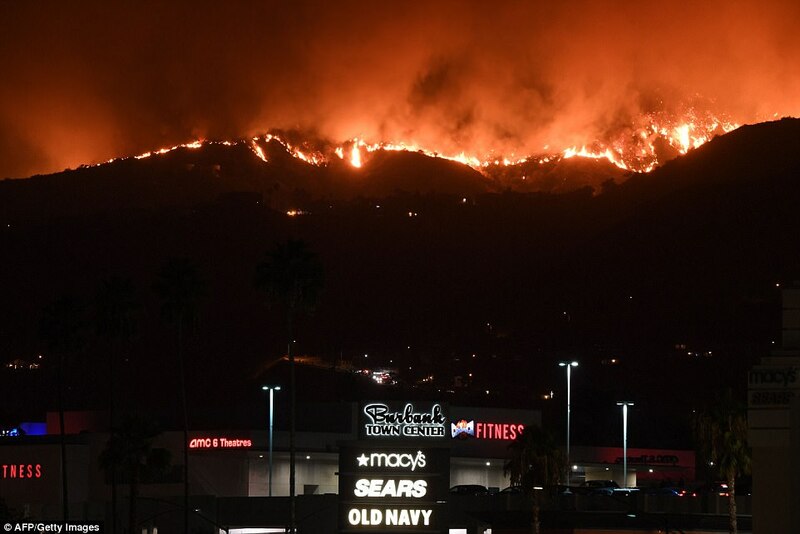 "MARIPOSA, Calif., July 19 (Reuters) - A 25,000-acre wildfire in central California, one of three dozen major blazes burning across the U.S. West, threatened hundreds of homes and businesses on Wednesday after forcing the evacuation of about 5,000 residents. There were 46 active large fires spread across 12 states, with 11 new blazes reported on Tuesday alone, according to National Interagency Fire Center website. Around 4.4 million acres have been burnt since the start of 2017, compared to 2.7 million acres in the same period last year, it said. Dry and windy conditions have fueled the wildfire season and thousands of people have been evacuated, including in Oregon and Nevada. Firefighters managed to contain 5 percent of the Detwiler Fire, which threatened 1,500 structures in tiny foothill communities in the Sierra Nevada mountains, authorities said. Around 2,000 residents were ordered to flee Mariposa, California on Tuesday. "Going to bed unsure whether Mariposa, my sweet hometown, will exist when I wake up," Jennifer Paquette said on Twitter late on Tuesday. A total of 5,000 residents were forced to evacuate several small communities southwest of Yosemite National Park since the fire began on Sunday, the California Interagency Incident Management Team said in a tweet." snip video Stay safe BC CHANIITES! "B.C. 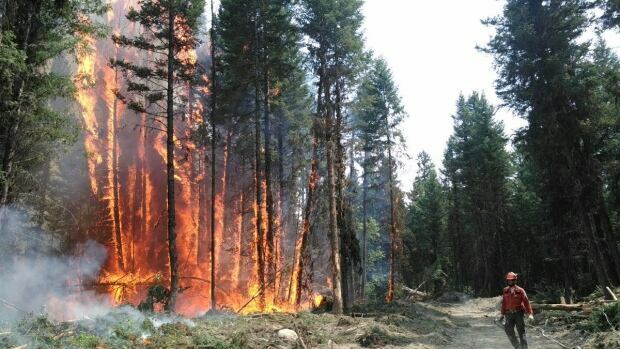 remains under a state of emergency as about 138 wildfires continue to burn across the province. About 6,000 British Columbians remain out of their homes during one of the worst wildfire seasons in B.C.’s history. Premier John Horgan has now extended the state of emergency by two weeks to the end of day on Aug. 4. Seattle's heat wave and the hazy, smoky air from British Columbia are due to this phenomenon: Our usual Pacific Ocean breeze isn't blowing. "It’s one of those good-news, bad-news situations. 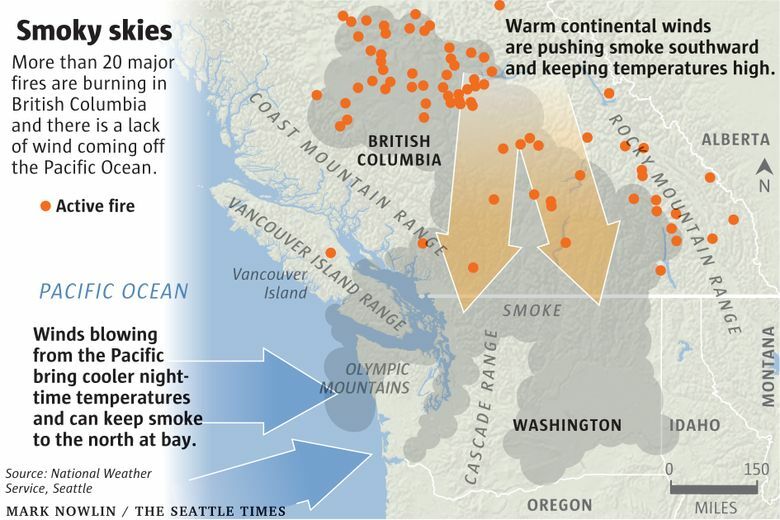 The smoke from fires raging in British Columbia have been swept down to the Puget Sound region by winds blowing from the interior of the continent toward the Pacific Ocean. 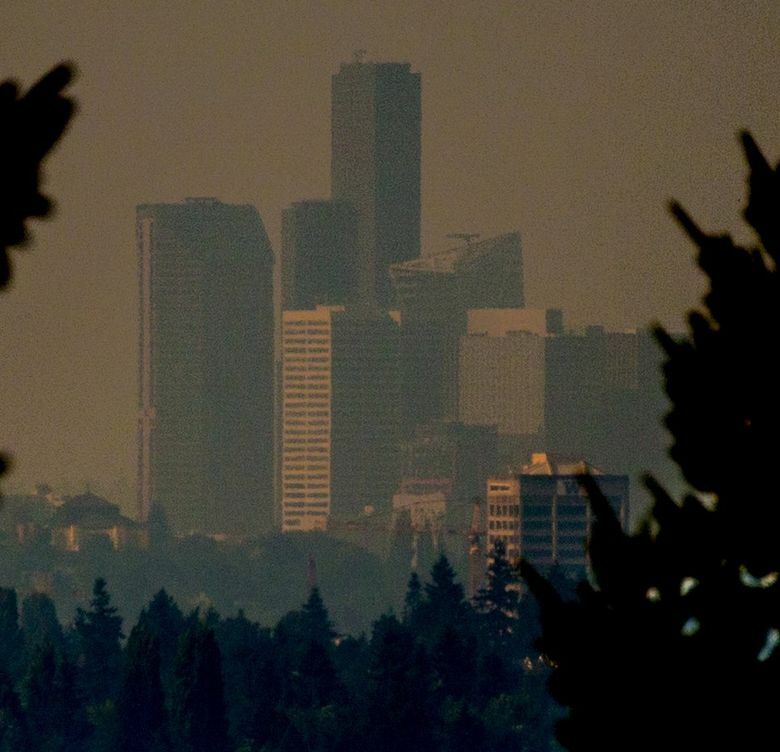 On one hand, the wildfire smoke is harming our air quality, and people with asthma are likely to feel it. On the other hand? The layer of smoke acts like a sunshine shield, which happens to be deploying at the beginning of Washington state’s intense heat wave. Here’s how the phenomenon works, according to the National Weather Service’s Seattle office:"
No, that's not Bejing, it is Seattle, today. It has made it all the way to Portland, Oregon. Seattle about 200 miles from BC to the N, about 200 miles from Portland to the S. Yes, we could see haze and smell smoke here. Brookings is a small coastal town 40 miles north of where I live. It has been very smoky here and we have several fires burning around us. This is the Chetco Bar Fire as seen from Brookings, Oregon. The relentless inferno (5 miles northeast of town) has burned over 102,000 acres and is 0% contained. The city and surrounding areas are under various evacuations. This is the NUMBER ONE priority fire in the U.S. with 1,400 people assigned to it. "More than 700 are forced to evacuate as 8,000 acres are scorched in blaze and hundreds of firefighters struggle to cope due to 100F heatwave and 'very erratic' winds"
Has anyone noticed that people are now collapsing these fires into the climate change diatribe?